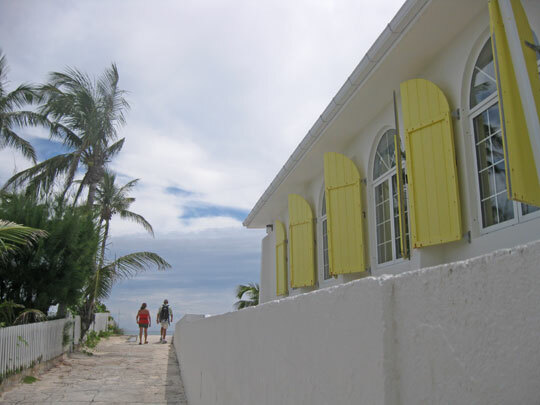 When I was thinking about places to visit before Debbie and Karen arrived I thought about Hopetown. Greg and I hadnâ€™t been there yet. The water leading to the harbor is very shallow for a long way out and it would be a taxing journey with our deep draft boat. I thought maybe we would take the ferry from Marsh Harbour. Then I saw the ferry prices, $27 a person round trip. This is a little steep for us. So it worked out well that Sea Spray Marina offered a free shuttle service to Hopetown, just a short drive from the marina on Elbow Cay. We headed there Wednesday morning. CUTE. The word for the day was cute. 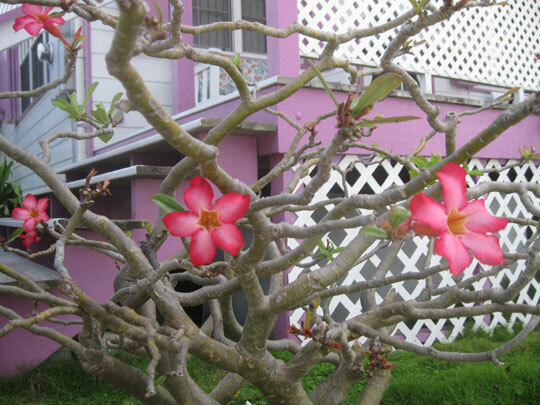 Hopetown is cute. Everything about it is cute. Terribly, terribly cute, cute, cute. Vehicular traffic is barred from the main part of this cute town making strolling through its cute narrow streets and past its cute cottages a relaxing experience. We visited a few cute gift shops, looked out over the ocean side, and made a trip to the museum. 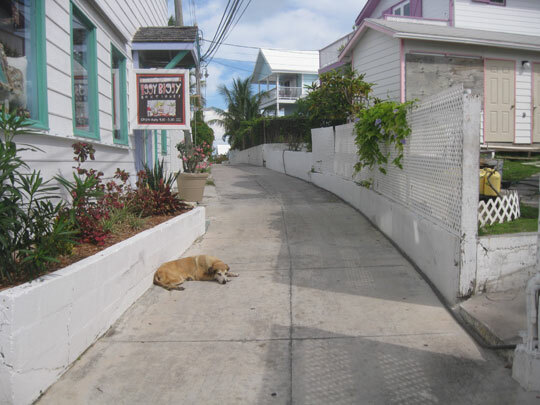 A typical street in Hopetown. 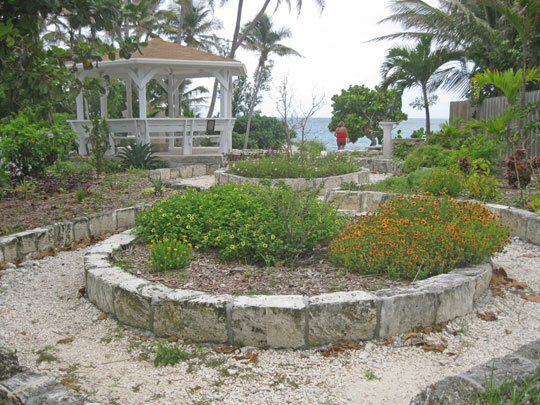 The Byrle Patterson Memorial Garden. A path to the ocean. The gang at the cute restaurant overlooking the harbor where we ate lunch. 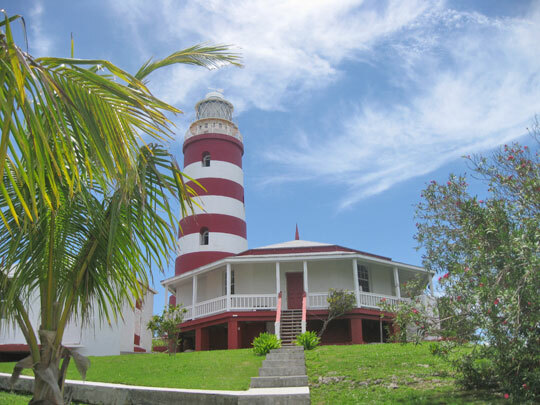 At the museum we learned that the loyalists who originally settled on Elbow Cay were extremely unhappy about, and tried all they could to prevent, the building of what would become the defining landmark of the island; the candy striped lighthouse that rises on the other side of the harbor. It seems that the residents, after trying their hand at trades such as farming (and finding the land of the cay inhospitable for growing anything), turned to saving sailors from ships wrecked on Elbow Cayâ€™s reef and then scavenging what little the poor sailors had left from their destroyed vessels. The lighthouse threatened this lucrative line of business. Little did they know that one day this lighthouse would become an object of not only pride, but also commerce, luring tourists and their dollars by the boatful to this cute, cute city. We were eager to visit the lighthouse, but the only way to get to the other side of the harbor was by boat, even though the water looked shallow enough in some spots to walk across. At one of the gift shops the clerk suggested that we wait at one of the docks and hitch a ride across, then wait on the other side and hope for a ride back. This didnâ€™t seem like a very timely plan. We had lunch a cute dockside restaurant overlooking the harbor with a very nice view of the cute lighthouse. We were still pondering how to get to it when the waitress arrived with the bill. Greg asked her the best way to get across the harbor to the landmark. She looked out over the water and said, â€œAnthony will take you,â€ as she flagged down a skiff, conveniently coming our way. Debbie and Karen quickly paid the bill and we all piled into Anthonyâ€™s boat. 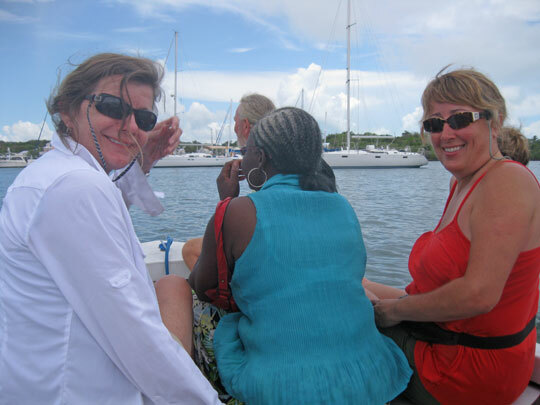 Karen and Debbie on Anthony's skiff with the cute little Bahamian woman between them. 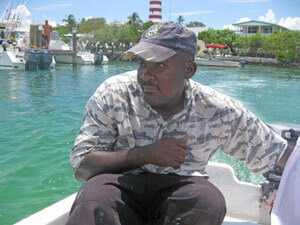 Our ferry across the Hopetown harbor, Anthony. Anthony said he had to make a quick stop at another dock first. There a cute elderly Bahamian lady was asking for a ride to the other side of the harbor. Anthony seemed reluctant to take her with us in the boat, but we told him it was no problem and she came on board. The lighthouse was great. It wasnâ€™t so tall as to wear you our before you reached the top. It was in amazing shape inside and out. 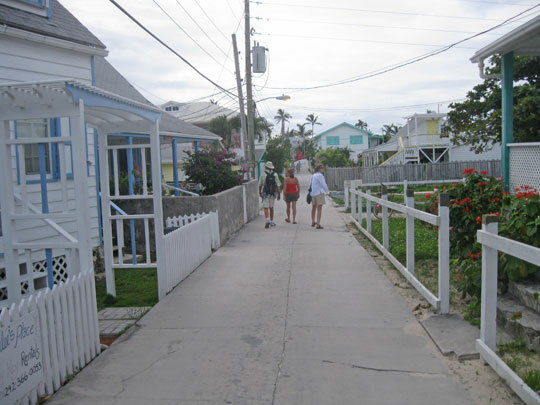 But the view wasnâ€™t cute like the rest of Hopetown, it was spectacular. 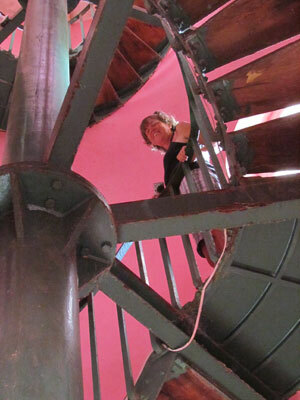 When we were done touring the lighthouse we found Anthony at an adjacent dock and he took us back. I hope Anthony was pleased with his tip, because he absolutely made our day. 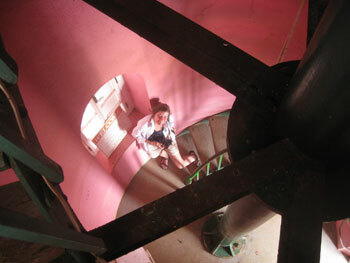 This is the little door you had to crawl through to get on to the lighthouse balcony. 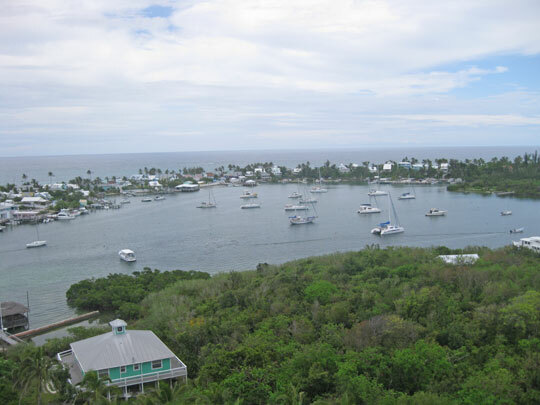 View of Hopetown Harbor and the cute little Hopetown business district. 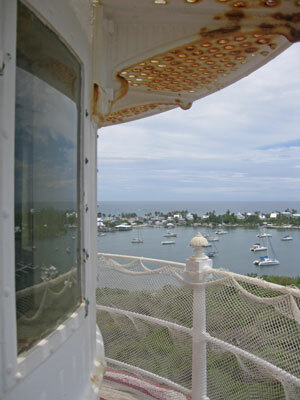 Another view from the lighthouse. 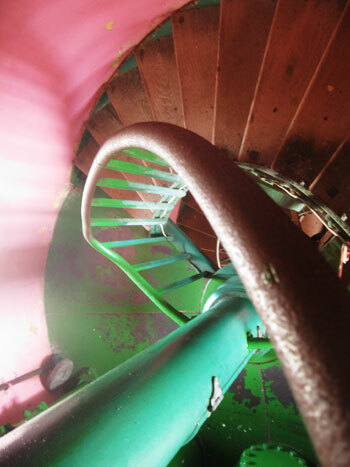 Shot inside the lighthouse looking down. It was time to head back to the marina, but first we made a trip to the liquor store. As we walked into the liquor store in Hope Town a couple was leaving. He was carrying a case of Miller Lite and patiently explaining that it would cost even more than 80$ to buy those 24 beers in a bar. Her expression was not as disdainful as you might expect. She was probably thinking about a cute 80$ straw hat she’d seen in a curio shop window earlier. Luckily, when we got inside we found some 16 oz. cans of Bush Crack malt liquor priced the same as beer. Paradise don’t come cheap. We left the marina without incident. 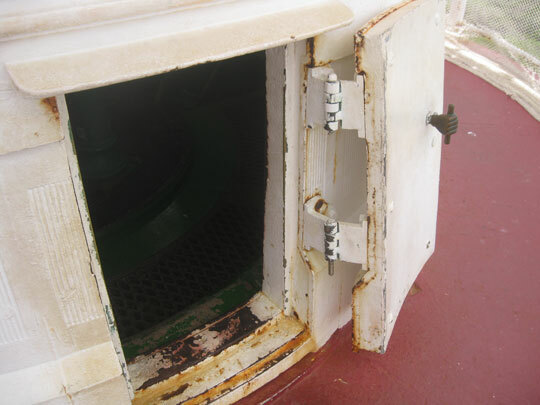 The trip out the channel was much less eventful than our trip in. All the water seemed to be there. The depth meter never dropped below two feet. 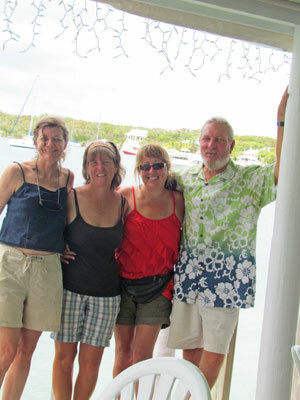 Our destination was an anchorage off the amazingly beautiful, but unfortunately private Matt Lowes Cay. Karen tried her hand at the helm this time and we had a very nice short late afternoon sail. As soon as we dropped the hook, Debbie went straight into the water. Karen finally takes the helm. That evening while I was cooking dinner we ran out of potable water. This was just a minor snag since we had reserve water in gallon jugs aboard and we would be heading to a marina the next day. Even though we were using a bit more water than usual, this was an awful lot of water for four people to go through in six days. I suspect that the second time we filled up before we left the Treasure Cay, the tanks did not get filled all of the way. We had BBQ seitan sandwiches and grilled fries for dinner on deck with the sun falling quickly in the west. 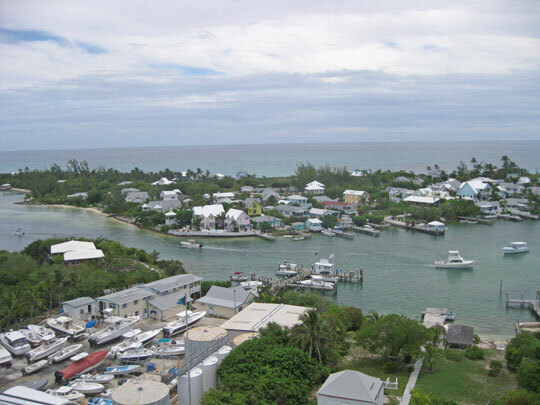 After dark, to the southeast, we could see the light of the Hopetown lighthouse sweeping over the sea of Abaco, luring travelers ashore to the cute, cute, cute streets, cottages, and shops of Hopetown, with liquor stores lying in wait at the end of the day with $80 cases of beer. 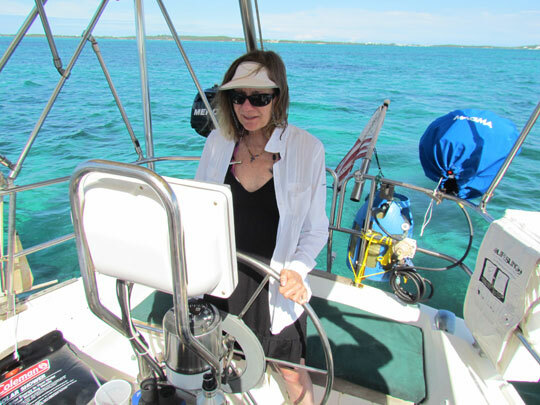 This entry was posted in Life on the Water, The Abacos, The Bahamas and tagged Bahamas Friend Visits, Cute, Debbie and Karen Visit, Elbow Cay, Friend Visits, Hopetown, Hopetown Lighthouse, The Abacos, The Bahamas. Bookmark the permalink. a great time had by all! Karen and Debbie had nothing but smiles when they talked about their trip.